Polish longer with less fatigue and smoother results! The Cyclo VES™ Yellow Weighted Insert for Cyclo Premium Pads and Pad Holders are part of Cyclo’s Vibration Elimination System. The Weighted Insert perfectly balances the weight of Cyclo’s Premium Pads and Pad Holders to provide the operator with a smoother motion with virtually no vibration. VES Weighted Inserts are sold two per pack. The Vibration Elimination System (VES™) is available exclusively on Cyclo Dual Head Orbital Polishers. This system is composed of a completely redesigned counterweight and precision-matched, weighted inserts. Prior to this innovation, the Cyclo Model 5 polisher imparted only about one-tenth the vibration of traditional rotary and dual action polishers. With the introduction of the Cyclo VES, the amount of vibration is reduced even further and nearly eliminated. This drastic reduction in vibration lessens muscle and joint fatigue for the operator. Counterweights are pre-installed on the Cyclo Model 5 Polisher with VES, and two weighted inserts are included that correspond to Cyclo’s Premium 4 inch Pads and Pad Holders. If you wish to use Cyclo Pad Holders instead of the backing plates, Cyclo recommends using these VES Yellow Weighted Inserts. The inserts are precision-matched to balance the weight of the pad holders and pads. You can see in the diagram to the right the size difference of the weighted inserts. To get the maximum benefit of the Vibration Elimination System, it is important to use the appropriate weighted inserts with the corresponding pads. By doing so, you can virtually eliminate the Cyclo polisher’s vibration. The benefits include less muscle and joint fatigue, and a reduced risk of nerve damage brought on by long-term exposure to mechanical vibration. 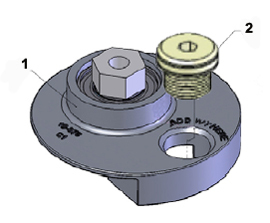 This image shows the VES counterweight (1) and the VES Yellow Weighted Insert (2). The Cyclo Orbital Polisher is already a nicely balanced, comfortable-to-use buffer. It’s a customer favorite. With VES and the weighted inserts, the Cyclo is even better. The weighted inserts are easy to install and VES really does eliminate most of the vibration. The overall experience is more comfortable and less fatiguing. We thought the original Cyclo was low on vibration, but the VES counterweights and weighted inserts make a difference you can really feel. To use the VES Yellow Weighted Inserts, you need the current Cyclo model 5 with VES. The machine comes with Yellow Weighted Inserts, which are precision-matched with Cyclo’s standard hook and loop pads used with Pad Holders. 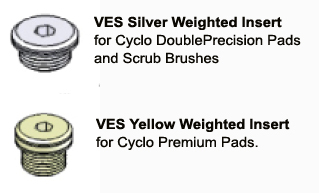 If you prefer to use Cyclo DoublePrecision Pads, Cyclo recommends that you install the VES Yellow Weighted Inserts. Get the best possible performance out of your Cyclo Orbital Polisher with the VES Yellow Weighted Inserts, precision-matched for the Cyclo Pad Holders and Premium Foam Pads. Click here to read more about VES.